"Thanks for Wild Bill, a great free profile making me profits at 6-max cash tables." 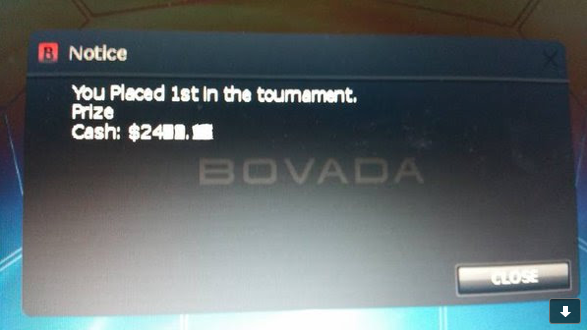 And here is an image a customer sent us when the bot took down 1st place at one of the regular Bovada tournaments for a $2400+ payday. Keep entering those tourneys, folks. It’s just a matter of time before you hit a big score. If you need software to help you enter them, the “tournament starter” add-on programs sold by third-party developers in our forum are inexpensive and reliable. Imagine having your bot join the juiciest tournaments automatically for you all day every day. That’s it for now. If you need a license, there’s a link for buying one on the bot itself. Have fun with version 8.4.2 and we’ll see you or your bot at the final table soon.